The Monrovia Library's Veterans' Resource Center will hold a special evening for women veterans on Friday, March 23, from 6:30 to 8 p.m. in the Library Community Room. Guest speaker will be retired Rear Admiral Sandra Adams, who served as commanding officer of five units, and as a senior adviser to an Afghan Minister of Defense Lieutenant General, held several Flag Officer Assignments. 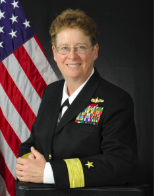 She has served as deputy commander for the Naval Expeditionary Combat Command, which is responsible for 19,000 active and reserve Sailors including Seabees and Coastal Warfare professionals. She was among the first women to serve officially at sea as a surface warfare officer from 1981 - 2015. Adams will speak about the many roles of women in the military, how their roles have evolved, and their significant contributions. Register at monroviapubliclibrary.org. Child care available. Refreshments. For more information contact Mabel Cross at mcross@ci.monrovia.ca.us or 256-8294.